A SWOT Analysis is a very important tool for us to use in business. Its stands for Strengths weaknesses, opportunities and threats. 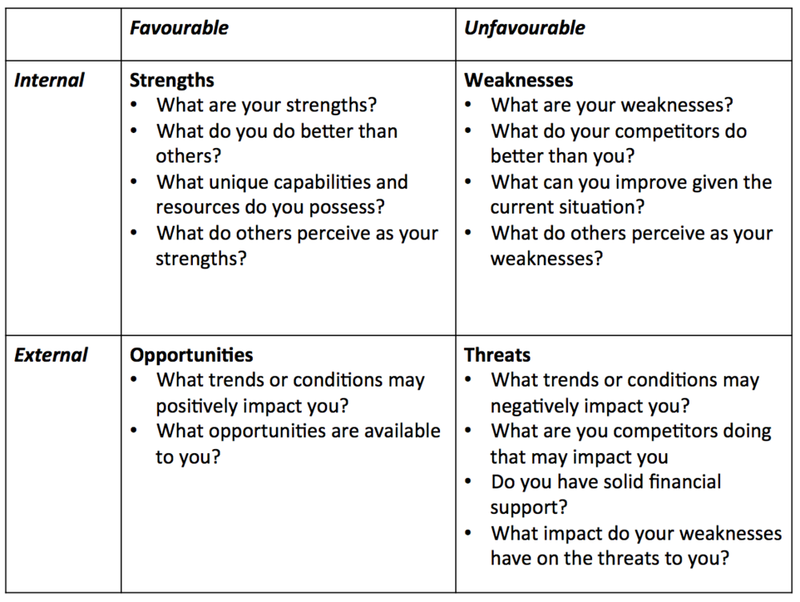 Consider a SWOT Analysis of yourself personally ,and then let’s apply it to your team. Have a think about what are your strengths? What are you good at? What are your weaknesses? what could you improve on we all have them? What are your opportunities? Where would you like to go in the future? And what are the threats for those opportunities to take place - what could stop you from achieving or reaching those opportunities? What our strengths are as a team, what do we do well? What are we really good at? What are our weaknesses we have within our team, so what skills do we need to recruit for to team, or ask outside help for. What are the opportunities for our team, so what would we like the design outcome of our app to be of our solution. Do we want to help with poverty, do we want to help save the environment, do we want to encourage children to read? What is our overall purpose? And what are the opportunities in order to get there? What are the threats - the things that could stop us from achieving that opportunity? For instance, what happens if team members get sick, what happens if team members go on holidays and are not available? What happens we don’t get the technology to develop the app working? These are some of the things to consider at this point. Consider what is great, what is not so great, what is possible and what could stop us from reaching those possibilities. This is a very tried and tested tool we use in business and we hope you learn a lot about your team and yourself in the process.